Baltimore Ravens guard Marshal Yanda ended any doubts about his future when he agreed to a contract extension that will keep him with the Ravens through the end of the 2020 season. There were rumors that the standout offensive lineman was considering retirement, so this deal will likely see him finish his career having played for the Ravens throughout his time in the NFL. Coming off the lowest-graded regular season of his career in which he produced an overall grade of 77.5, he was still the fourth-highest graded player at his position. 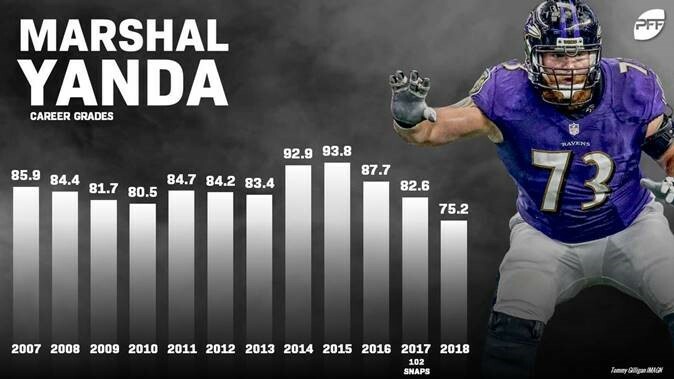 It was the first season where we have seen him produce a PFF grade lower than 80.0, highlighting over a decade of excellence since he arrived in Baltimore as a third-round draft pick out of Iowa back in 2007. It is a career that has seen him play over 400 snaps in a single season at right tackle, left guard and, the position he has occupied for much of his career, right guard. 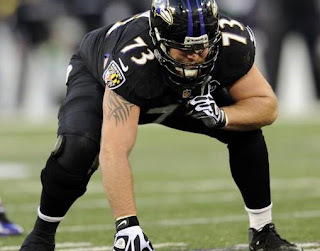 Regardless of where Yanda has played, he has looked comfortable as an offensive lineman in the NFL from Day One. Day One was at right tackle, operating as a bookend with Hall of Fame left tackle Jonathan Ogden for the 10 games in which he was healthy enough to start. Even in the twilight of his career, Ogden was dominant, allowing just eight total pressures on 314 pass-blocking snaps. Giving an early glimpse into how special a player he could be, Yanda allowed only 20 total pressures on 517 pass-blocking snaps from the right side that same year. He was the seventh-highest graded offensive tackle in the NFL as a rookie, with his 85.9 overall grade coming out tops among all rookie offensive linemen, just ahead of future Hall of Famer, Joe Thomas. 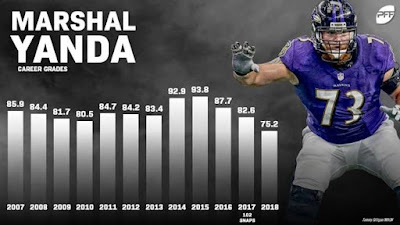 Yanda would move inside to right guard in 2008, but in 2010, he once again found himself at right tackle and produced an overall grade of 80.5 to rank 12th at the position. What’s interesting is that for a player who has built a Canton-worthy career at guard, Yanda proved himself to be one of the best tackles in the NFL in the two seasons where he has been asked to play there. The Ravens saw that as good as he was at tackle, he was dominant inside at guard, and this was never more apparent than during the 2014 and 2015 seasons. The highest-graded player in the NFL at the position both years and one of the very best players in the entire league, Yanda mauled anyone who got in his way in the run game. The 2015 season was particularly special, with his 93.8 overall grade ranking as the third-highest graded season for a guard since we began grading back in 2006, trailing only New England’s Logan Mankins in 2008 (94.2) and Philadelphia’s Evan Mathis in 2013 (94.9). Most importantly, he’s still a good offensive lineman in today’s NFL and hits the 2019 season with his first healthy offseason in several years. Stellar in pass protection, Yanda hasn’t allowed a sack since Week 7 of the 2015 season. He’s played 1,767 pass blocking snaps since Week 8 of that season and not once has his quarterback been sacked due to Yanda being beaten. In fact, in that same stretch, he has allowed just four quarterback hits, and just 29 total pressures, working out at a pressure once every 60.9 pass-blocking snaps and a hit once every 441.8. His span of starts since he last allowed a sack sits at 41 games, and in those 41 games, he’s ended with a perfectly clean slate in pass protection 21 times. The Ravens’ offseason moves so far have seen them get weaker at wide receiver, and stronger in the running game thanks to the addition of former New Orleans Saints star Mark Ingram. With only the draft remaining this offseason, the Ravens very much appear to be leaning into the fact that they will be a run-first team, very much going against the norm in the NFL right now. We know that passing has more value than running, but the Ravens are at least able to boost their rushing attack by having a big-play threat like Lamar Jackson at quarterback. If you take the Ravens’ rushing stats from when Jackson took over as the starting quarterback and extrapolate them over a full 16 game season, then this is a team that has the potential to rush for over 3,000 yards in 2019. If they do indeed hope to achieve that, having a reliable force on the right side of the line is a must and, as we reach the latter stages of Yanda’s career, we should appreciate his consistent dominance on the offensive line while we can. His career is worthy of a spot in Canton, Ohio, and keeping him around for the next two seasons is key to what the Ravens look to do on offense.